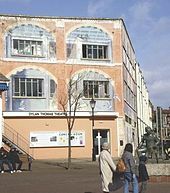 Thomas was born in Swansea, Wales, in 1914. An undistinguished pupil, he left school at 16 and became a journalist for a short time. Many of his works appeared in print while he was still a teenager, and the publication in 1934 of "Light breaks where no sun shines" caught the attention of the literary world. While living in London, Thomas met Caitlin Macnamara, whom he married in 1937. 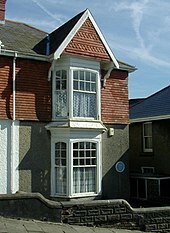 In 1938 they moved to the Welsh fishing village of Laugharne where from 1949 they settled permanently and brought up their three children. ^ a b Jackson, Paul (2014). 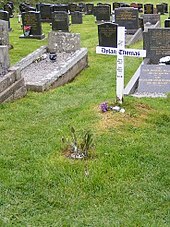 "Dylan Thomas: the Anti-Fascist Propagandist". In Ellis, Hannah. 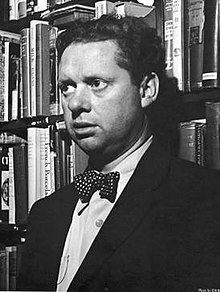 Dylan Thomas: A Centenary Celebration. Bloomsbury Publishing. pp. 90–101. ^ Ferns, John (1995). ""The Petals of the Man": The Relationship of David Holbrooks Criticism to his Poetry". In Webb, Edwin. Powers of Being: David Holbrook and his Work. Fairleigh Dickinson University Press. p. 234. ISBN 978-0-8386-3529-2. Retrieved 28 July 2012. 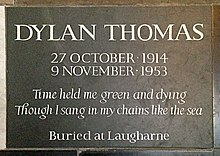 ^ "Restored Dylan Thomas memorial unveiled". 2018-11-09. Retrieved 2019-03-31.